Steel tonnage: 3,500tAn enormous £90M warehouse at Central Park in Avonmouth, under construction for retailer The Range, will be the largest Birmingham-based commercial property developer Stoford has ever delivered. Providing more than 111,000m² of space, it will be the biggest single building in the South West and one of the largest in the UK. It is claimed to be the equivalent size of 15 Wembley Stadiums. With good transportation links and close to the Second Severn Crossing, the hub will bring 1,000 jobs to the region and inject millions of pounds into the local economy. As the site is close to the banks of the River Severn, the ground contains soft alluvial deposits and a total of 16,000 concrete piles have been installed, to a depth of 20m, in order to support the ground slab, the steel-frame of the warehouse and its internal racking system. To keep the programme on schedule, the construction sequence was arranged so that Caunton Engineering erected the steelwork immediately behind the piling operation. The sequential operation was then repeated with the cladding and roofing contractors along with the concreting team installing the ground slab following on behind Caunton’s steelwork erectors. 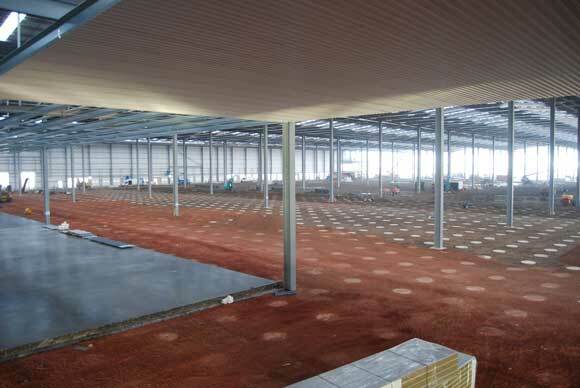 Overall, the building measures 480m in length, which equates to 60 × 8m-wide bays. 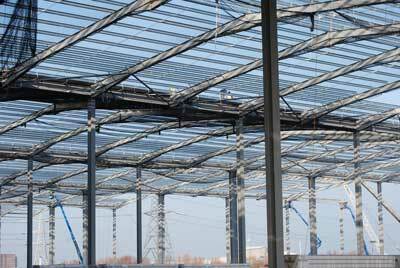 It has six spans of 36.5m giving the warehouse a total width of 220m. The roof was strengthened at either end of the building to support two sprinkler platforms at low level. Extending for five bays at each end and covering the entire width of the warehouse, the false ceilings are hung from the rafters and provide maintenance access to the low level sprinkler system. All of the rafters were brought to site in 18.25m lengths. For the erection process two sections were bolted together on the ground to form the entire span, which was then lifted into place using one of Caunton’s on-site mobile cranes. One end of the warehouse contains a single-storey office block, measuring 16m (two bays) × 45m-wide, which equates to about one and half spans. This internal steel braced frame is attached to the perimeter steelwork and topped with a composite slab. Flexibility has been designed into this part of the steelwork so a second storey could be added in the future. Another notable feature of the warehouse is the fact that there are 104 loading dock doors within the wall panels, and a couple of external canopies that accommodate 14 goods-in/goods-out level access doors. Adjacent to the canopies, on the inside of the warehouse, are two further transport hub office areas. The Range distribution hub is expected to be fully operational by the end of the year. Apart from the overall size, The Range distribution centre is of conventional portal frame design, illustrating the economic dominance of this form of construction when enclosing large volumes. The spans of 36.5 m and centres of 8 m are quite orthodox, and 15 m clear to the underside of the haunch is not uncommon for this form of distribution facility. The sheer size of the structure does bring one rather unusual issue, which is the contribution of drag to the overall wind loads. Clause 2.1.3.8 of BS 6399-2 covers the frictional drag component, which comprises a frictional force from the walls (Clause 2.4.5) and a frictional force from the roof (Clause 2.5.10), both depending on the type of surface and thus the frictional drag coefficient from Table 6. For walls, the frictional drag is assumed to act over all of zone C (the most downwind zone, away from the turbulence that causes high local suctions at the windward edges). For roofs, when wind is blowing parallel to the ridge(s), frictional drag is again assumed to act over zone D, the most downwind zone. For small buildings, the effect of drag is often rather insignificant, but for The Range distribution centre, the unfactored contribution of drag, from the roof alone, was 1200 kN. In contrast, the overall load from the pressure and suction on the end elevations was approximately 2800 kN, so the drag from the roof alone increased the overall force by over 40%. With larger plan buildings, the lesson is to never neglect drag – it can be considerable. 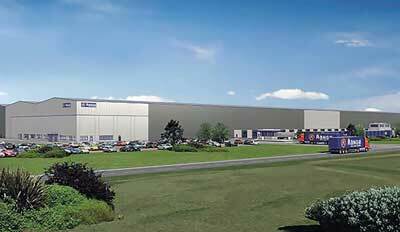 Distribution centres, as their name implies, are almost certain to have many openings on the elevations. Depending on the direction of the wind and the location of the openings, much increased pressure or suction inside the building could be the result. This is the effect of a dominant opening, covered in Clause 2.6.2 of BS 6399-2. The designer must carefully consider if assuming the doors to be shut in the event of a severe storm is realistic. BS EN 1991-1-4 requires that if an opening would be dominant (almost certainly) yet is assumed shut, the accident of the door being open should be considered. A second challenge with distribution centres is that the large doors can often mean that locating vertical bracing on the elevations can be problematic. This was the case at The Range distribution centre, so portalised bracing was adopted around the door openings and conventional diagonal bracing above.